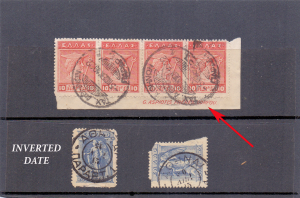 Corner band of 4X10 l Lithographic stamps (inscription G.ASPIOTIS FRERES CORFU) canc. "ΤΑΧ. ΑΘΗΝΩΝ - ΠΑΡΑΡΤ. 1 * -5 ΝΟΕΜ. 1922" pmk. 25 l Lithographic stamp canc type V pmk "ΑΘΗΝΑΙ - ΠΑΡΑΡΤ. 1 * 21 ΙΑΝ. 13". (inverted date). 25 l Lithographic stamp (defective) canc type V pmk "ΑΘΗΝΑΙ - ΠΑΡΑΡΤ. 1 * 20 ΑΠΡ. 15". 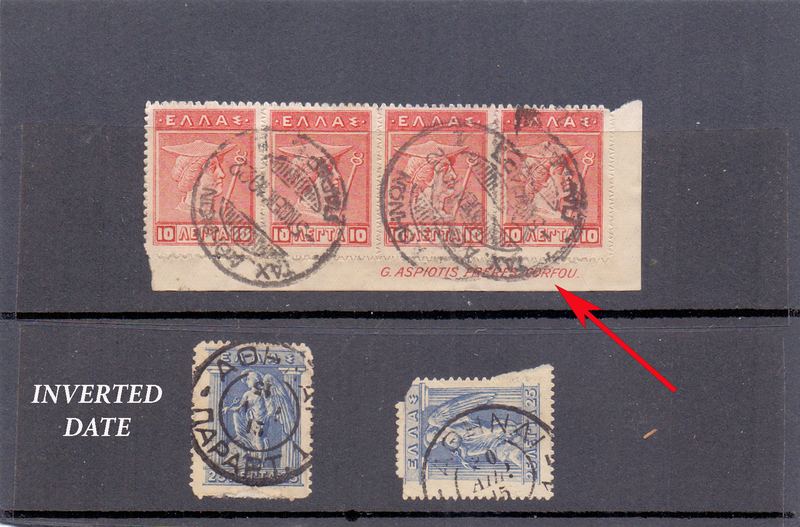 Greece, Athens, Corner band of 4X10 l and two loses Lithographic stamps with Athens cancellations.